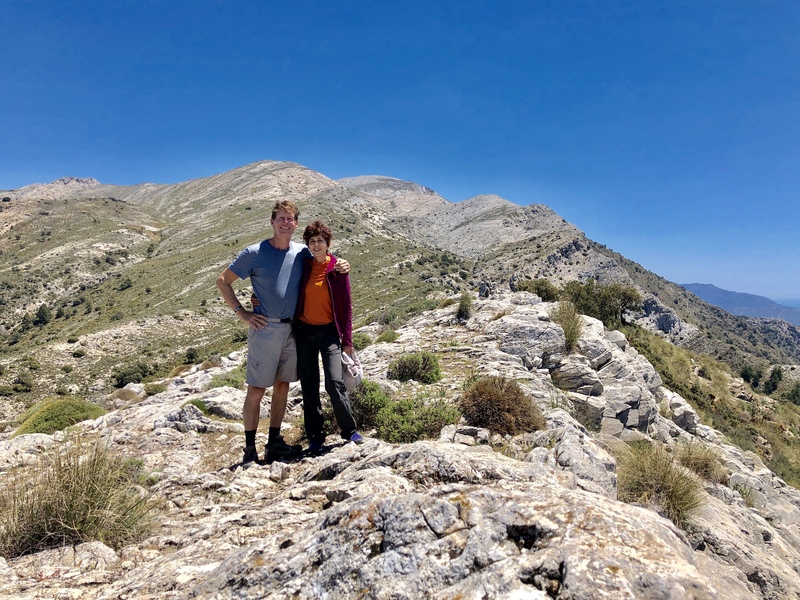 We came to Spain expecting to cycle but I had a hamstring injury so we changed our focus to hiking, which doesn’t seem to put as much stress on my hamstring. I find hiking in Spain rather frustrating. While France has fantastic signposts that tell direction and how long hikes will take, Spain seems to leave you to figure things out on your own. Several times I’ve been very glad to have downloaded gpx files with waypoints. I use the Pocket Earth app on my iPhone for viewing the map with waypoints. A popular site for finding trails is Wikiloc, from which you can download gpx files to use with your phone or GPS device. A downside of Wikiloc is that there are often multiple entries for the same walk, contributed by different people. I much prefer finding a book that describes the hikes or a curated web site when I’m first visiting an area. We spent time in several different towns in the Costa Tropical, doing various hikes. However I’m not going to give hiking details as that would be too complicated. I used the book, Walk! 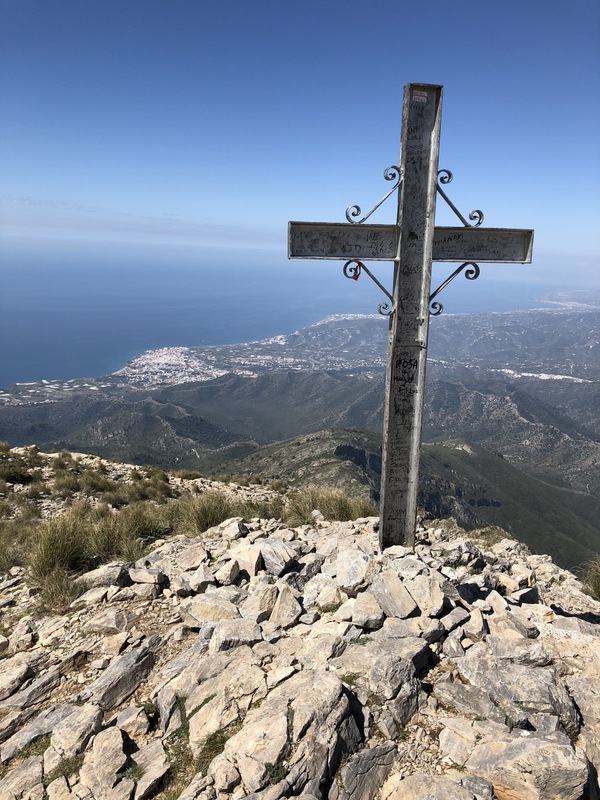 Costa del Sol (Axarquia), which provides wonderful descriptions of the hikes, as well as instructions on how to get to the hikes, and photos of key decision points in the hike. It also gives a link so you can download gpx files with waypoints for the various hikes. I like long hikes that end up at the top of something, so I’m only going to mention a few of the hikes I did, the ones I enjoyed the most. I give the hike number in the 2017 version of Walk! Costa del Sol (Axarquia). El Lucero (#36) is fantastic, far and away the best hike I did in the area. The full hike starts at Fabrica de la Luz, about 3 km above Canillas de Albaido. If you want a shorter hike, you can drive up a gravel road to Puerto Blanquillo. The full hike is 19.6 km with 1,225 meters of ascent; the shorter hike is 9.6 km with 675 meters of ascent. The full hike is split into two distinct parts. The first part, from Fabrica de la Luz to Puerto Blanquillo follows the river up the valley. It’s pretty, and varies between rainforest and desert. But the second part, from Puerto Blanquillo to the summit is the fantastic part. 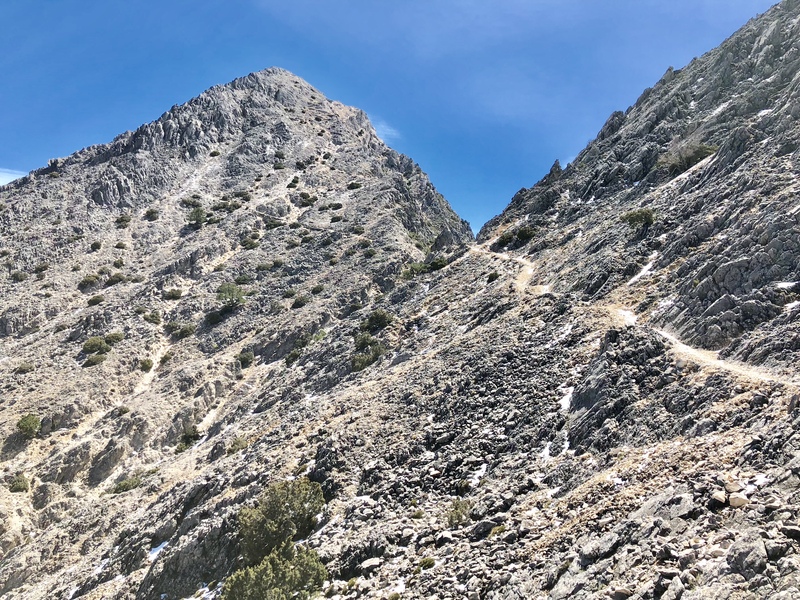 If you click on the photo above and expand to maximum size, you can just see the wonderful tight switchbacks leading to the summit. Alto de Cielo (#38) is another good hike with great views. Starting by the Nerja Caves in Maro, it takes you to the top of the highest peak that is close to the sea. The last part is surprisingly steep and a bit loose. It’s a popular trail, and I saw several trail runners on it. Torrecilla (#34) is an unusual hike, starting just above Alcausín. It start with a seemingly never-ending steep dirt and concrete road. The road finally ends at a somewhat random spot, from where a wonderful rocky trail leads ever higher, past several false summits, to a small summit with spectacular views of Maroma and the sea. We stayed in Güéjar Sierra and did a few hikes from here. There is a wonderful web site that provides very good descriptions and maps as PDFs, along with gpx files of waypoints that you can download. I’m just mentioning two of the best ones – details can be found on the web site I mentioned. 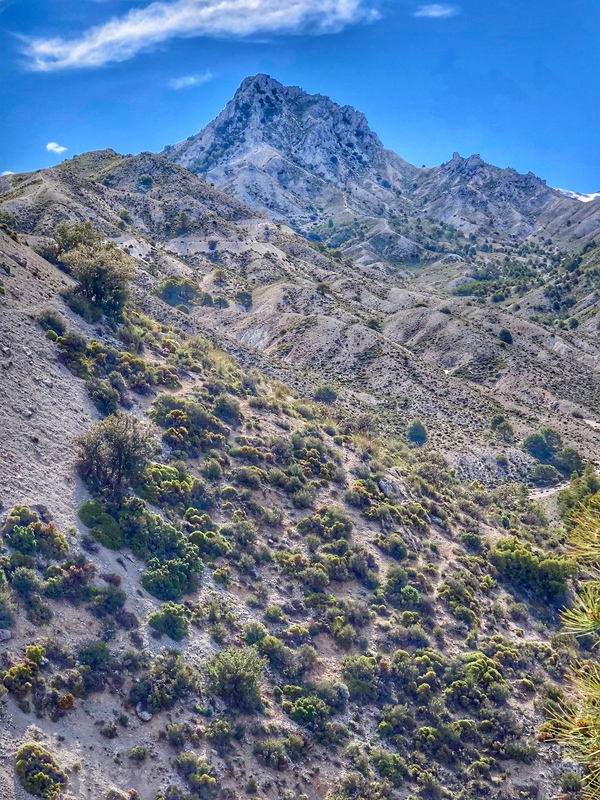 The most famous hike in this area is the Vereda de la Estrella, a long but easy walk along a deep canyon, with spectacular drop-offs to the side. 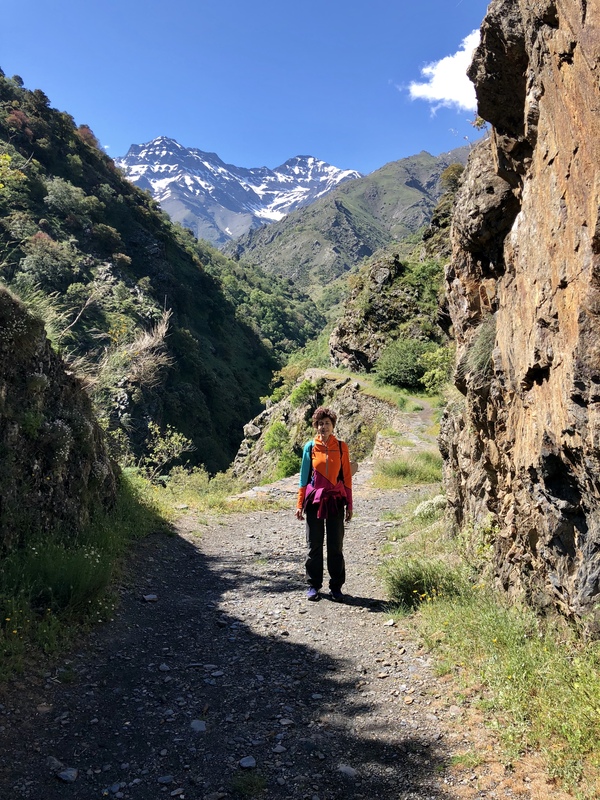 The best way to do this hike however, is to do the Vereda de la Estrella Loop, going out on a trail high up on the left hand side, with spectacular views of the 3 high peaks: Mulhacén, Veleta, Alcazaba. Then coming back along the standard trail. A wonderful hike, varied and interesting, mainly not too hard but with a tough ascent to, and descent from the summit. The terrain varies from bleak and moonscape to forested. The summit climb is not for the faint-hearted, consisting of steep gravelly slopes and even some scrambling on rock. What an incredible area. Beautiful mountains, deep gorges, spectacular cliffs. We visited after several weeks of relentless rain and discovered that some of the trails were simply too waterlogged to enjoy. But we found other trails to be in fantastic condition. So, where to stay? The towns with the greatest number of hikes nearby are the tiny town of Sotres in the north, and Posada de Valdeón in the south. The biggest tourist towns are Cangas de Onís to the northwest, and Potes to the east. If you want more than hiking, Cangas de Onís is pretty and full of life, but it has no mountain views and it’s quite a way from most of the hiking, with the exception of the hiking around the Lagos de Covadonga. Potes is smaller, but also pretty and busy, with a much more beautiful backdrop than Cangas. It’s a 23 km drive from Fuente De, the cable car that gives easy access to hiking in the beautiful high mountains. If you only care about the hiking, stay in Sotres or Posada de Valdeón. If you think Sotres is too small and Cangas is too big, Arenas de Cabrales gives good access to the northern hiking without too much driving. Since the hiking is quite spread out, if you are in the Picos de Europa for a while it’s probably worth spending time in different towns. 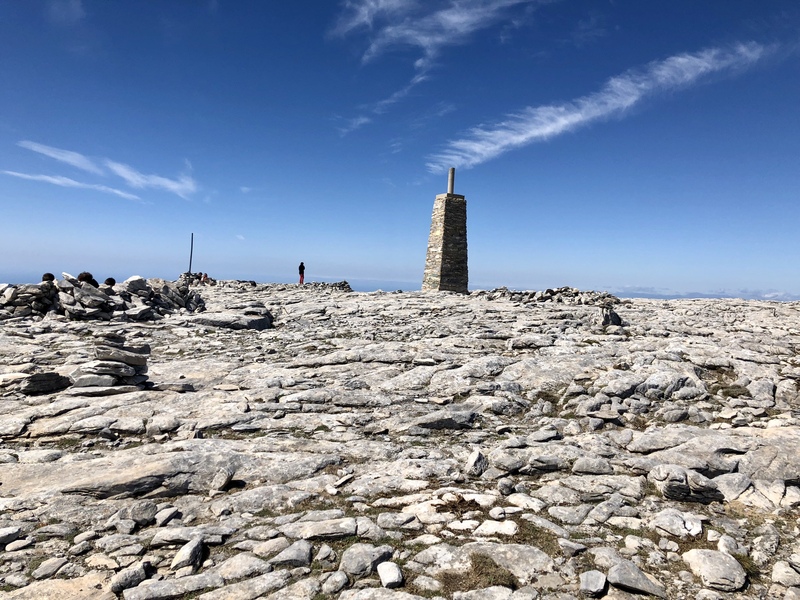 And of course you could to what is probably the best way to explore the area, which is to stay in the mountain huts, the refugios, and hike between them. We met one couple who were spending six days hiking between the refugios. I found it difficult to find good information about the hiking trails. The maps that the tourist office – and the Picos de Europa park office – give out are some of the poorest I’ve seen. 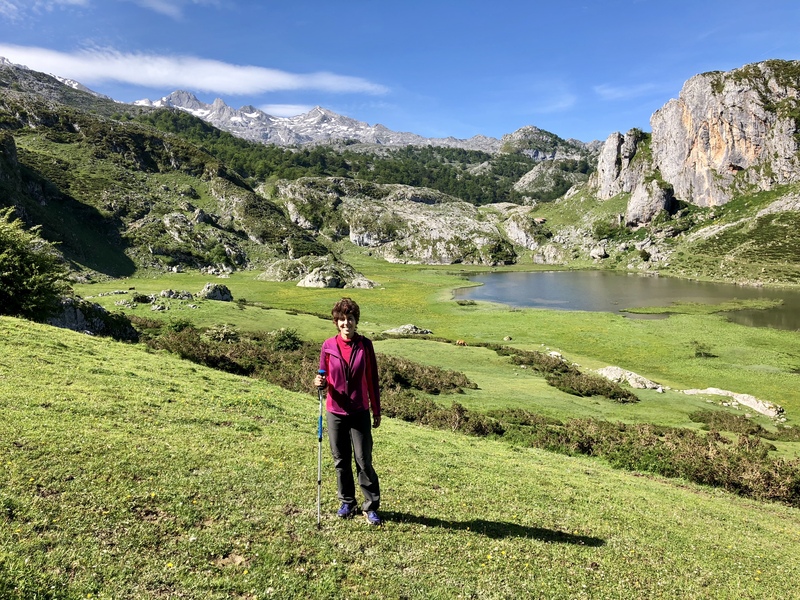 There are quite a few hiking guide books in Spanish, but the only one I could find in English was Los Picos de Europa (link below), which is not particularly good. On to the hiking. One of the most popular areas, beautiful and wide open, is the Lagos de Covadonga area, which is most easily accessed from Cangas de Onís. You basically can’t drive to the Lagos; you can drive to Covadonga and park in one of the big parking areas, then take the bus to the Lagos. At the time we were there, it was 9 € a person for the roundtrip from Covadonga to the Lagos. If you prefer you can get the bus in Cangas. 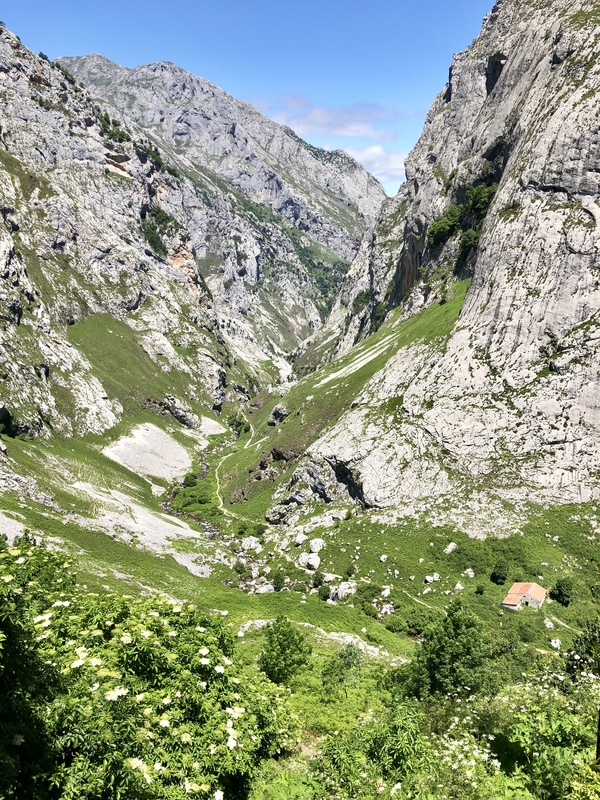 Also known as the Garganta del Cares, the Ruta del Cares, the Divine Gorge, this is the most famous hike in the Picos de Europa, and one of the most famous in Spain. It’s easy, and it sees about 300,000 hikers a year. You can do it from either end – Poncebos or Caín – and apparently most people do it starting in Poncebos. However, there are a large number of people who start in Caín and hike just a few kilometers and back, as you get the most bang-for-the-buck in terms of excitement starting in Caín. The trail is somewhere between 10.3 and 13 km each way (you’ll see various distances on official signs), and officially takes 3h 15m according to the signs. Everything about this hike is beautiful. Poncebos lies in a stunning canyon of white rocks, Caín has a stunning backdrop of jagged mountains, and the hike truly is incredible, following a narrow path (usually around 1.5 – 2 meters wide) high, high above the deep canyon. You’ll pass goats, and if you’re unlucky, you’ll pass sheep that can’t figure out whether to run ahead of you or try to escape behind you. The trail itself is quite remarkable, having been built as a maintenance trail for a canal that runs from Caín to Poncebos, providing water for a hydro-electric scheme in Poncebos. The canal is visible for short sections but most of it goes through long tunnels bored through the cliffs. It’s mind boggling to think about how the canal and trail were created. We started in Poncebos. Drive past Poncebos up the road as far as you can. After a short way the asphalt turns into concrete; park somewhere here if you can. On a busy day the whole road will be filled with cars, so if you are here in peak tourist season either get there early or avoid weekends – or both. About 100 meters up the concrete, the trail leaves the road by doubling back steeply to the right – it’s well marked. From here to the end there are no decisions to be made as the trail is incredibly obvious. Hike uphill for about 2 km, then a gentle downhill takes to to the flatter part of the trail, which goes on for kilometer after kilometer through spectacular scenery, sometimes through short tunnels (a few meters), sometimes above precipitous cliffs, sometimes above slightly less scary slopes. As you are reaching the southern end, you get closer to the river so the noise increases. Just before Caín you go through a long, long tunnel. Fortunately there are breaks so you get some light, but having a small flashlight or the flashlight on your phone can help you avoid the larger puddles on the ground. You also go over a few bridges, and just before Caín, you pass a dam. I don’t know what the water is like in autumn, but in June there is an huge amount of water flowing down the river, and cascading down the mountain slopes from holes in the rocks. Once in Caín, a small village with an gorgeous backdrop of mountains, we saw plenty of people refreshing themselves with beer or coffee. Most people turn round and walk back. If you only want to do it one way, the simplest is to have friends walk the other way, then switch car keys when you meet them! Otherwise, you’ll find plenty of references on the Internet where people talk about how a taxi costs 120 €. I found a couple of places where people talk about a bus service, and where a shuttle is offered (links below). This is a more interesting start. Rather than doing the gradual 2 km climb, you instead follow a flat trail then do a much steeper climb to join the main trail. You can see the lower trail in the photo above, as well as the path diagonally crossing the big talus slope to join the main upper trail. Instead of cutting back right on the main trail, continue walking along the road. It eventually becomes a narrow trail, slightly narrower than the main trail. Follow the trail along, and after a while you will pass below some incredible high, steep cliffs. Once past these cliffs a bowl opens up on the right with an obvious steep trail leading up into it. Climb this trail as it zig-zags up, then when it seems to peter out, look right and you’ll see the trail continuing round the cliff on a lovely wall. Follow the path round and up then eventually you cross a huge talus slope to join the main path. If you are in Poncebos to hike the Cares Gorge, another good but much shorter trail heads up to the hamlet of Bulnes. 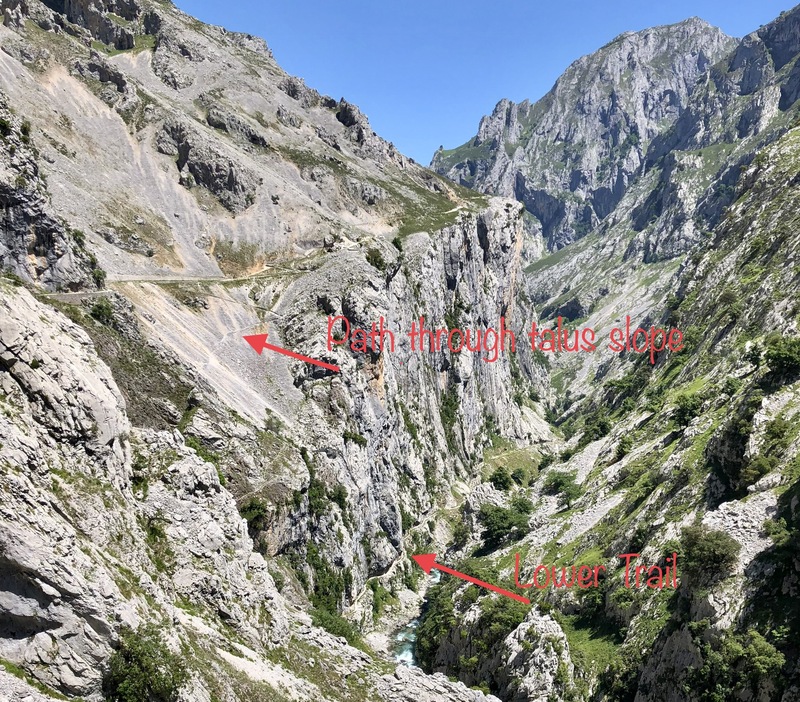 Starting where the road turns from asphalt to concrete, descend to the river, cross on a narrow stone bridge, and follow the trail up the left side of the valley to the hamlet of Bulnes. The sign says it’s 1h 15m. Shortly before Bulnes you’ll reach an intersection, keep going straight and you’ll pass the entrance to the funicular, then you’ll reach Bulnes de Abajo (lower Bulnes). 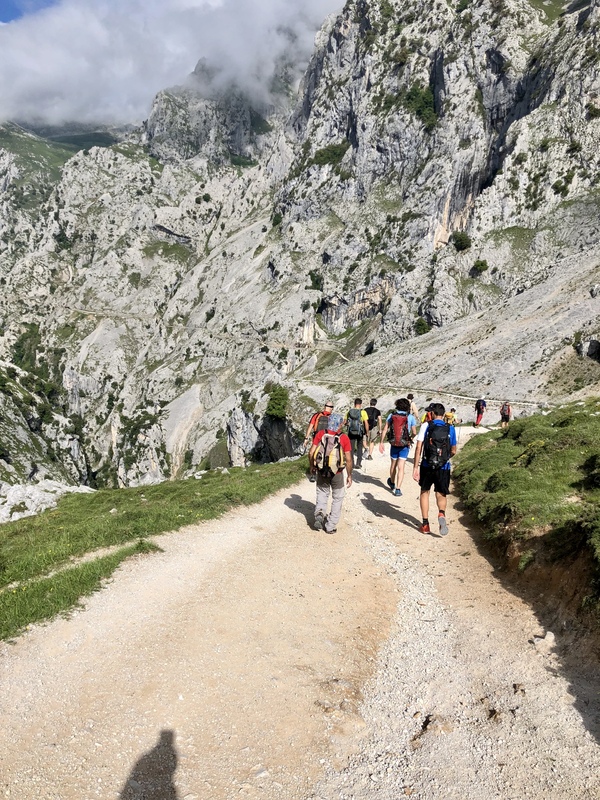 From here a 10 minute walk uphill takes you to a viewpoint of the crown jewel of the Picos, the Naranjo de Bulnes, also known as Picu Urriellu. Back down in Bulnes de Abajo again, follow the road through the hamlet and to the right, and you’ll reach Bulnes de Arriba (upper Bulnes). This is even smaller, with one restaurant. A narrower trail takes to back down to the main trail to Poncebos. Walk! Costa del Sol (Axarquia), by Charles Davis. This link is for Amazon.co.uk but I bought the book at the Salamandra outdoor store in Cómpeta. The associated gpx files are available here. Sierra Nevada hikes along with waypoints. There is a map view, and here’s the page for the hikes near Güéjar Sierra. Wikiloc. A site for user-contributed walks with gpx files for download. Los Picos de Europa – an English language guidebook to hiking in the Picos. Lovely photos of Bulnes and the Lagos de Covadonga. Lovely photos of the Cares Gorge. A Trip Advisor page about taking the bus between Caín and Poncebos. A page offering shuttle rides between Caín and Poncebos.